Great townhome at the edge of Bozeman with walking, biking and bird watching trails along Bridger Creek nearby. Cable TV and Wi-Fi available, with a separate office space that is perfect for those on working vacations. Elegant master suite with a large jacuzzi tub and walk-in shower. There is a air conditioning unit in the master bedroom. Brief Description: The Maiden Star Townhouse is a well-appointed and well-designed property that features three bedrooms, including a elegant master suite on the main level. Ideally located, this townhouse has the best of both worlds in Bozeman. It's close enough to historic downtown to easily bike or drive to, yet it's nestled at the edge of town with mountain views. Enjoy easy access to town and be only minutes to several outdoor activities, including hiking, biking, skiing and golfing. Bedrooms and baths: There are three bedrooms at the Maiden Star Townhouse, two with their own private balcony or patio. There are two and a half baths. 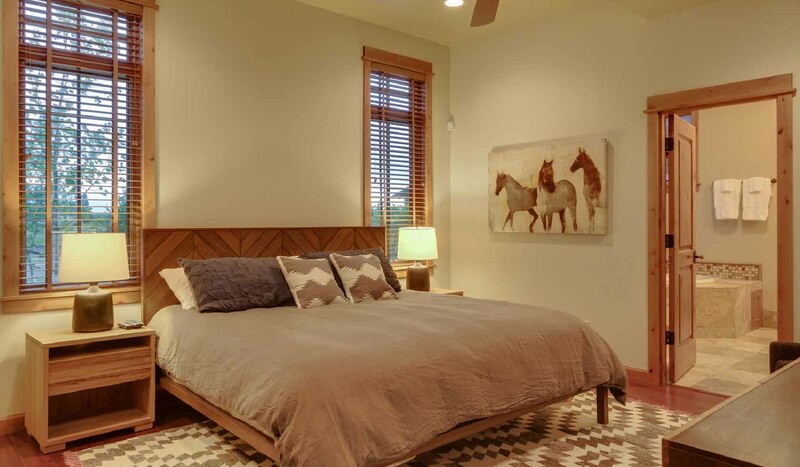 The master bedroom on the main level has a king size bed and a full private bathroom with two sinks, jacuzzi tub and a large, walk-in, double-headed shower. There is also a air conditioning unit in the master bedroom. The other two bedrooms are on the second level and each has a private balcony. One has a king size bed and the other has two extra long twin beds. These rooms share a bath with tub and shower. There is a half bath on the main level. Kitchen: A beautiful open kitchen awaits you! The chef in your group will love the easy layout of the kitchen and the high-end stainless steel appliances, granite slab counter tops, great supply of small appliances, and very good quality cookware and serving ware. There is also a Keurig 2.0 coffee maker. Enjoy the bar counter for chatting with the cook, and the dining table is just off to the side. Dining area: There's a lovely dining room steps from the kitchen and open to the living area. Just a few feet away is the kitchen bar, which seats four. Living room: The living room is open to the dining and kitchen areas, with a beautiful gas-fired rock fireplace. Additionally, there is an office nook, which is perfect for those working while on vacation. Setting, acreage, views: Maiden Star Townhouse is within the very nicely done new Legends at Bridger Creek neighborhood at the edge of Bozeman. The developers did a great job linking the property into our community trail system (perfect for walking, biking, birding and even cross country skiing), and making it an attractive neighborhood. Activities nearby: Besides hiking, biking and skiing on your trails, you are just across the road from Bridger Creek Golf Course, the best public course in Bozeman, you're just 14 miles from Bridger Bowl Ski Area and a few more from Bohart Ranch Cross Country Ski Area. There is fishing on the nearby East Gallatin and main Gallatin Rivers, horseback riding, rafting and everything that the fun town of Bozeman has to offer. Yellowstone Park is a beautiful 1.5 hours drive away, and for a world-class guided experience in the park, be sure to book a tour with our sister company Greater Yellowstone Guides.